Mary Katherine Appleton McLaurine was born on March 8, 1927, and went home to Heaven on February 6, 2019, at the age of 91 years with her children by her side. She was born to William Frederick Appleton and his wife Fannie Pearl Bass at their country home near Wills Point, Texas. At the age of two years old, Katherine and her little brother Don went to live with their grandfather and aunt. Katherine was lovingly raised on the farm until she married Elgin McLaurine on October 16, 1945, just three weeks after he returned home from World War II. Katherine and Elgin were married for 62 years and to this union three children were born: Henry Clayton, Margarette Ann, and William Lee. Their first home was in Goldsmith, Texas in a very small trailer. Katherine worked in the home in Andrews, Texas taking care of many small children in order for her to stay at home and care for her own family. In 1961, the family was transferred to Oklahoma. Later, Katherine went to work at the Laverne School as a cook, she later became the Cafeteria Supervisor for 25 years. She was fondly remembered for her cinnamon rolls, peanut butter spread, and the black skillet fried chicken. She loved cooking for the kids - and even had to tell a teacher or two that she really wasn’t cooking for them, but for the kids. One of her greatest desires was that her family members become Christians and have a walk with the Lord. Katherine accepted the Lord as her personal Savior at a young age at the Elwood Baptist Church near Wills Point, Texas. 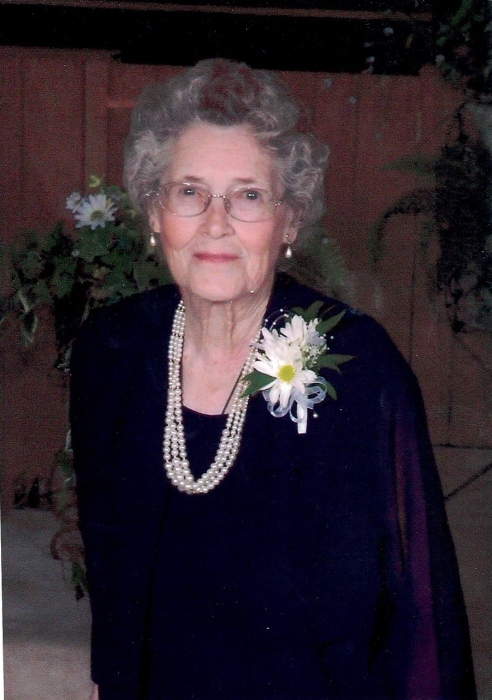 She was a member of Calvary Baptist in Andrews, Texas and was currently a member of the Laverne First Baptist Church where she had been a member for the last 58 years. Katherine dearly loved her church and always arrived at church in her Sunday best dress. One of the sights that will be missed by the children and grandchildren will be the Bible that was always beside their parents’ chairs with many “worn” pages. One of Katherine’s greatest loves was to make quilts. She began doing this at age four, when her aunt would give her scraps to cut from for her first quilt top. Until the time Katherine had to go and live at Parkview Assisted Living, she made quilt tops of every description; from king size quilts (which she said she’d never do another one) to baby quilts - she always had the next one in her mind. When Katherine and Elgin moved to Oklahoma from Texas, it was so very hard to accept but they knew the Lord always had a plan of some kind. Over the years, that plan was that all three of their children would find their lifelong Christian mates in the Laverne area: Clayton married Juanell Laverty; Margarette married Ray Hendrick and Lee married Patrece Carlisle. Family was very important to Katherine and Elgin and did their very best to pass in those values. Three years ago, Katherine went to live at Parkview where she had the greatest of care and felt love from everyone. She enjoyed playing dominoes and doing crafts with the other residents. She always wanted to know when she could go home and “How are you doing Ray?” Katherine was preceded in death by her husband, Elgin, her parents, W.F. Appleton and Fannie Pearl , her grandfather- C.C. Appleton, her aunt - Fannie Margarette Appleton, and her son, Clayton McLaurine and one great granddaughter- Savannah Faiths Bittle. Her survivors are her children Juanell McLaurine of Spring Branch, Texas; Margarette and Ray Hendrick of Laverne; and Lee and Patrece McLaurine of Laverne. Her grandchildren Joy and Henry McLaurine of Gulf Breeze, FL, Christi and Pat Strike of Spring Branch, TX, Kelly Hendrick of Laverne, OK, Edie Patrick of Laverne, OK, LeAnn and Ken Bittle of Edmond, OK, Amy and Josh Snider, Helena and Andrew McLaurine, all of Laverne. Eleven great-grandchildren, and numerous nieces and nephews, and the wonderful friends and caregivers at Parkview Assisted Living.